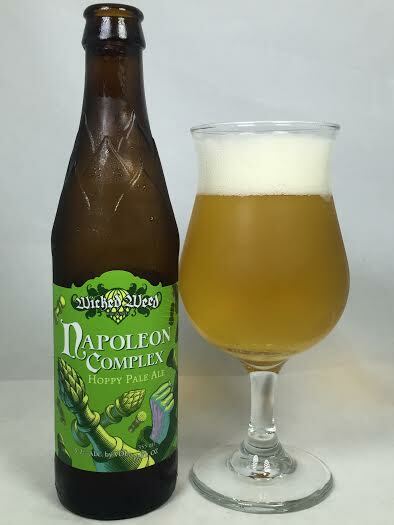 "Napoleon Complex is a small-statured pale ale with a larger-than-life attitude. Ignoring the industry standard of diminutive hop presence and mild manner, this pale ale will have most IPA’s contemplating their inadequacy. Little beer, big flavor, even bigger ego." Pours a transparent goldenrod color with two fingers of bright white head. The aroma is malt-forward with some earthiness. There's a little touch of dankness as well as some citrus. The taste yields some flavors that were absent from the aroma with the biggest ones being acidic citrus contributors of lemon and some more of the orange. Malty sweetness takes over in the middle of the mouth and it leaves no trace of any of the faint existence of the zesty lemon. Another interesting addition is some noticeable spiciness which is adding to the diverse range of flavors we have going on here. Not that any of these are big and bold enough to blow you away, but they are here nonetheless. The body is not the fullest I've ever had, but it isn't exactly watered-down. It's a 5.2% pale ale and it feels as such. A nice palate of flavors with nothing unpleasant make drinkability high as does the calm mouthfeel. Napoleon Complex is a rather basic pale ale without anything harsh enough to belittle it. As far as the style goes, this doesn't pack enough of a hop punch or juice to make it stand out from the crowd, but at the same time, I don't have a problem with it. It's standard, but with a nice variety of flavors. There area unit quite 800 species of ticks throughout the planet." It's faithful say that they're uncontrollable and may attach to anyone of any age. sadly, there's barely a lot of you'll do concerning the amount of them in your yards and close woodlands. if you want to know more then please visit our Cannabis Stores in Durango website.